As I've been working on the Japanese bead embroidery project Wild Child it's made me remember my first, and possibly only other, bead embroidery endeavour. 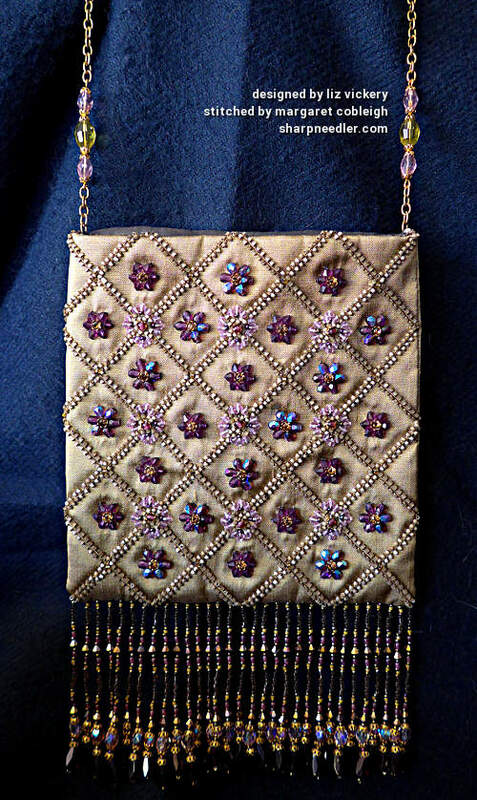 This is a beautiful little purse, designed by Liz Vickery, called Rare Vintage. 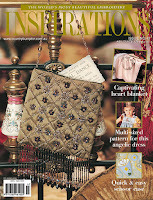 It was the cover project on Inspirations issue #47. Often, when I see a potential embroidery project something specific will catch my eye and I'll think, 'I have to stitch that!'. It may not have anything to do with the main piece; it can be something tangential to the project as a whole. 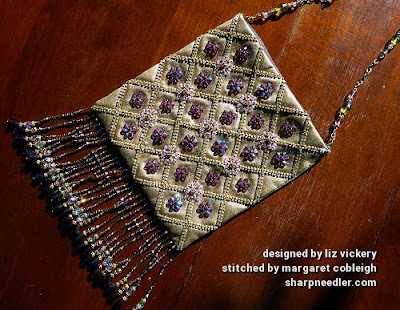 In the case of Rare Vintage, the part of the purse that made me want to stitch it was the fringe. While I thought the purse itself was lovely, the fringe was the thing! I simply had to do it and ordered the kit. Because the fringe goes on last, the entire purse--except for the chain--had to be completely finished first. There would be no excuses for not finishing the purse and definitely no instant gratification as far as the fringe was concerned. I had to earn my way towards making the fringe. The ground fabric is a pin-tucked bronze-gold dupioni silk. It's beautiful. What wasn't so beautiful is that all of the pin-tucking is lined with little beads on both sides of the pin-tucks. It took donkey's years to apply all those little beads. I remember being so glad when I finished. They look amazing so it was definitely worth the effort. The centres--inside the squares formed by the pin-tucks--went much faster and they were fun to do. I basted long diagonal stitches in each pin-tucked square so I could tell where the centre beads should go. 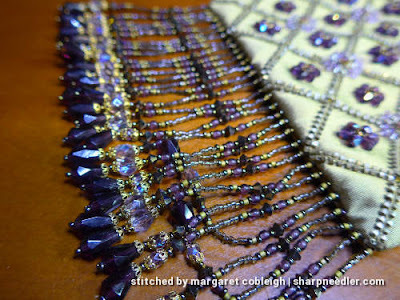 The diagonal stitches also helped with placing the surrounding beads. Overall, the stitching on the purse was not difficult and it was interesting to do embroidery that was not thread-based. I finished the purse, including inserting a magnetic clasp. I had never done anything like that before and was quite pleased with myself for several days after. Somehow I managed to sew the sides about as perfectly as I possibly could. No beads are behind the seams and I didn't sew over any of them when I was constructing the purse. I'm not quite sure how I did that. I was very lucky! Finally, I got to make the fringe. It didn't disappoint and I had a great time creating each string of beads that makes up the fringe. I didn't know how to ensure that the fringing would be evenly spaced, so I created a paper template using drawing software that automatically spaced out the number of lines that I needed over the given width. I used the template to place each string. The fringe turned out fairly even, much better than if I'd done it by eye. The final component of the purse was the chain, which is a combination of beads on wires and chain segments. While it's very pretty, it's probably the most problematic part of the purse as the beaded sections bend quite easily. This makes it difficult if you want to actually use the purse. 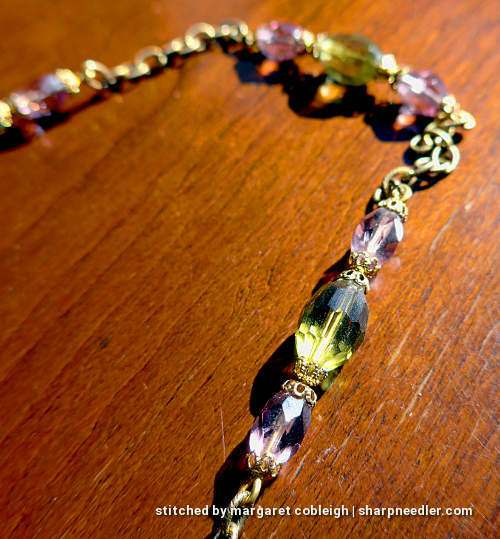 Quite a bit of care is needed in order to not inadvertently bend the beaded elements of the chain. With the chain attached, the purse was completely finished. It might seem a shame to not use the purse, but I enjoyed stitching and finishing it. I view the little bag as a purely decorative item and am delighted every time I see it! This is so beautiful Margaret. Do you know if the kits are still available? Thank you for the compliment. The magazine issue is well over 10 years old so, no, I don't think kits are still available. 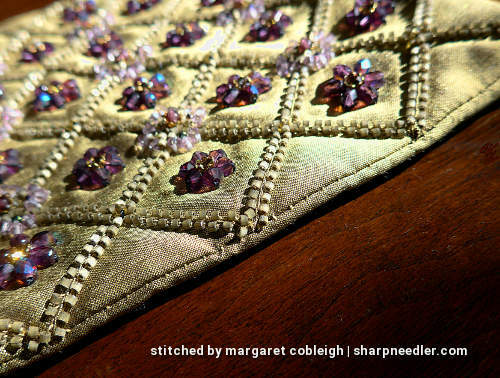 One of the problems with old issues of 'Inspirations' is that if you see a project you like, unless it's thread-based, it can be a challenge to find materials. Issue #47 is still available in print form for purchase from the Inspirations Studios web site and I'm sure it's available elsewhere on the web. I don't have access to my copy at the moment so I can't see the supplies list. I think you could probably find the necessary beads and fabric to make a similar, or possibly nearly exact, version. I know there's gold pin tucked dupioni around and I don't think the beads were particularly unusual. 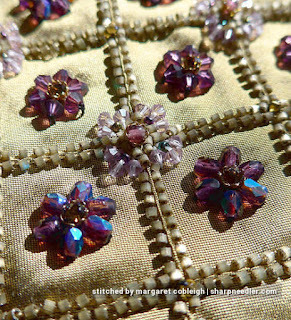 If one were to stitch this today, the one thing about the design that I wouldn't alter--especially if you changed the ground fabric colour--is to make sure that the little beads that line the pin tucks are a really close colour match to the ground fabric. With all that being said, it was a wonderful project and I would encourage anyone interested in it to give it a go. It wasn't difficult. It's gorgeous! Great job on it. 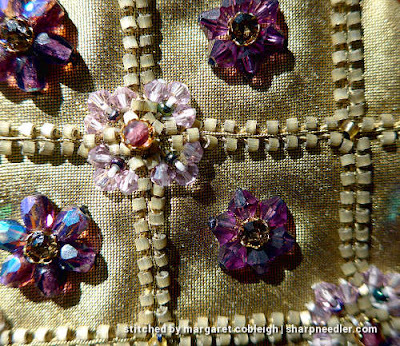 Along with the fringe I also couldn't resist the goldish fabric with (mostly) purple beads. It's a gorgeous combination. That is just gorgeous...ell worth the effort and time! A lovely purse! I think I would be too worried to use it practically as well - a lovely decoration for your house.